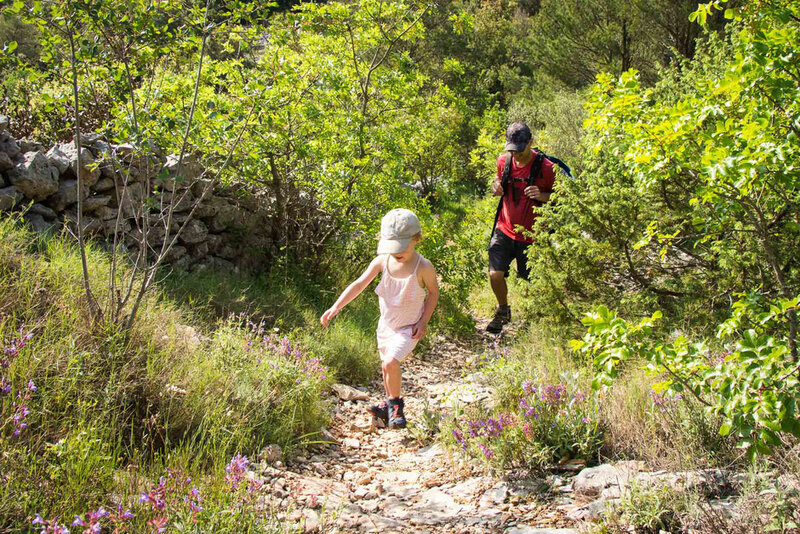 After the amazing hiking we did on Hvar with kids, we knew we wanted to do more hiking in Croatia. 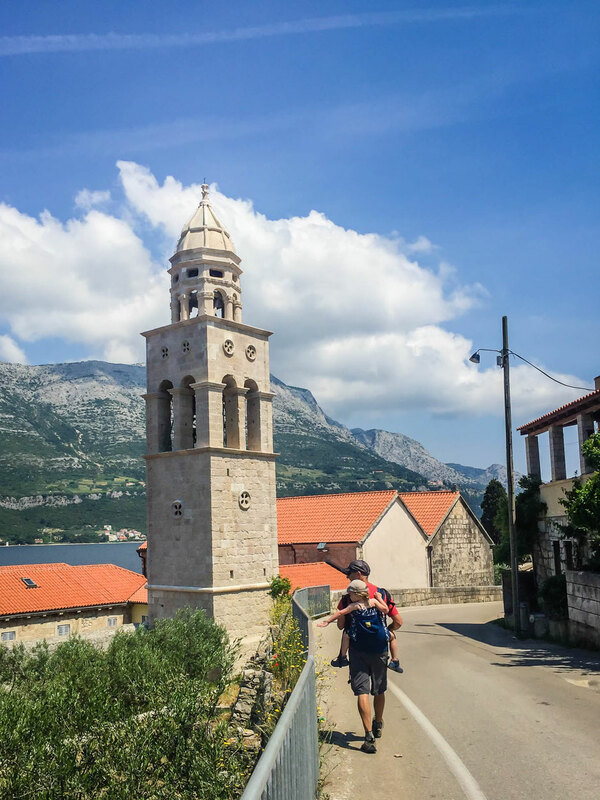 This hike from Korčula to Kocje with our two small kids ended up being one of the best on our Eastern Europe trip! 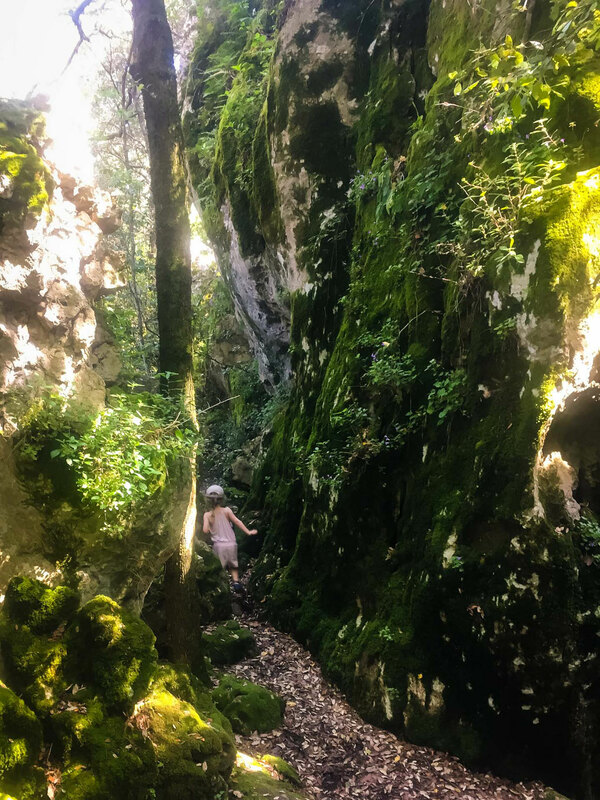 The Kocje protected area is home to a narrow valley with some pretty amazing rock formations. This small area is overgrown with moss and ivy vines, turning the place vibrant green, even in the shade, making the whole place feel magical. 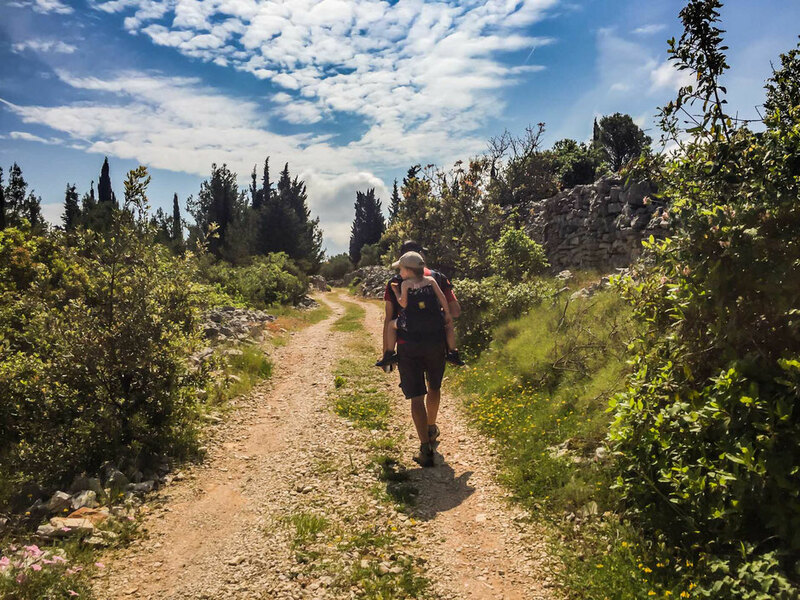 We started our hike at 7:45am just south of the Korcula Old Town. We had the kids in their carriers at first so we could get some good distance under our belts quickly. We started walking west up a set of stairs on Bernarda Bernardi. These stairs wind their way through some local houses until you leave the city, cross a road and enter a park. The stairs continue upwards up a reasonably steep hill, but soon enough you reach the top where you find “Fortica“, a small fort built by the British in the early 1800’s. You can’t go inside, but it’s fun to take a quick walk around. 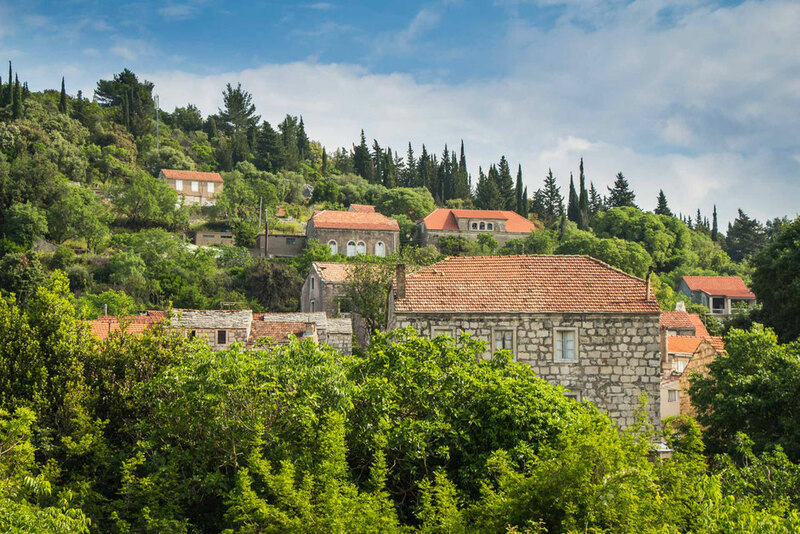 Sadly, after all that effort climbing stairs, the surrounding trees block the view of the historical Korcula Old Town below. 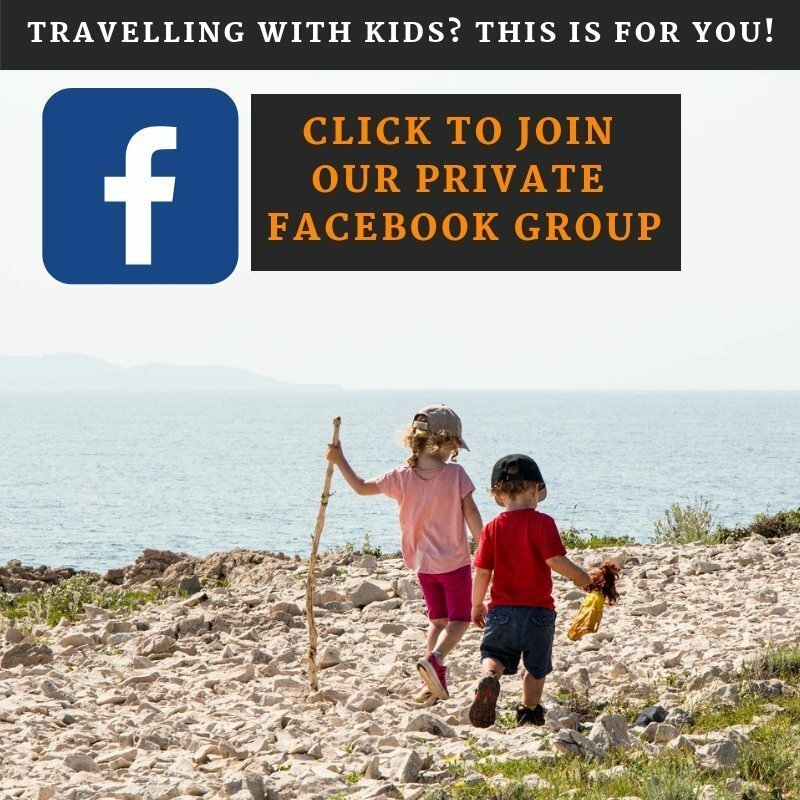 Looking for info on other places in Croatia with kids? 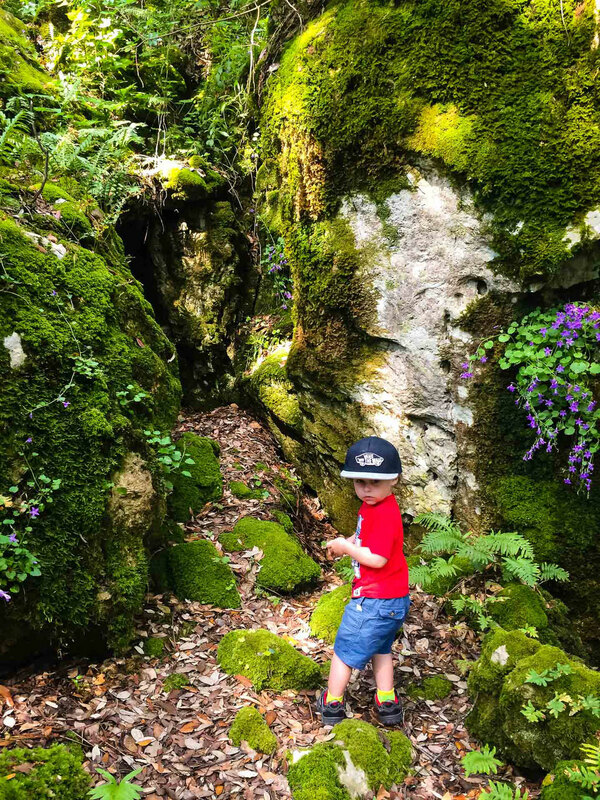 Don’t miss our post full of tips on Plitvice Lakes with kids and things to do in Split with kids. After a minute or two walking around Fortica, we walked down the hill on the opposite side until we arrive at the main highway. 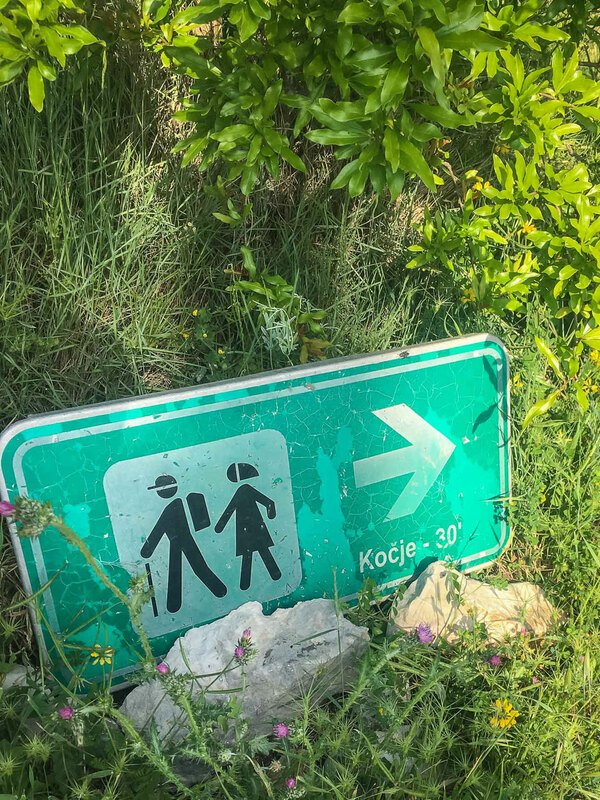 We had to walk on the edge of the highway for about a kilometer when we were able to turn off and start hiking on a country road – watch for the sign to Kocje to know where to turn. Soon you come to a junction with the trail forking into three – take the middle one. The kids loved running along this quiet road, where we didn’t see another soul. 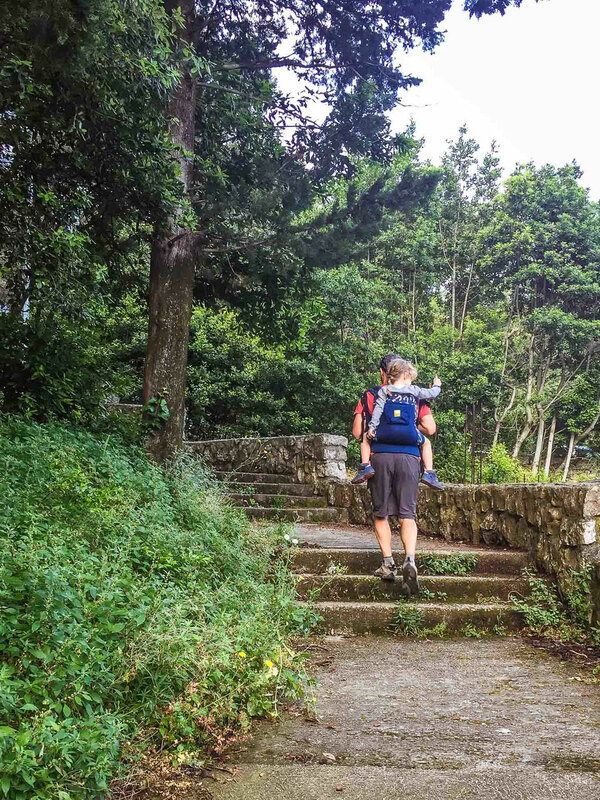 This well treed trail leads you to Zrnovo, one of the oldest settlements on the island. This is a really beautiful, historic town and it’s worth slowing down to soak it in. 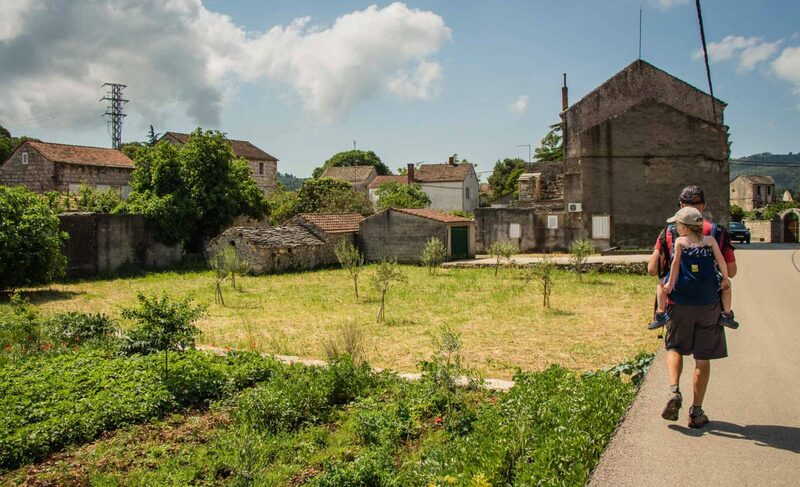 There are a lot of beautiful old buildings, churches, ruins of old houses, flower gardens, etc. If you are there late enough, there is a café there to stop and enjoy some refreshments. We put the kids in their carriers so they could enjoy a snack while we walked slowly south though town (while also not having to worry about them on the roads). Soon we turned west at what appeared to be a WWI memorial. This road leads you out of town and back onto an old country road. 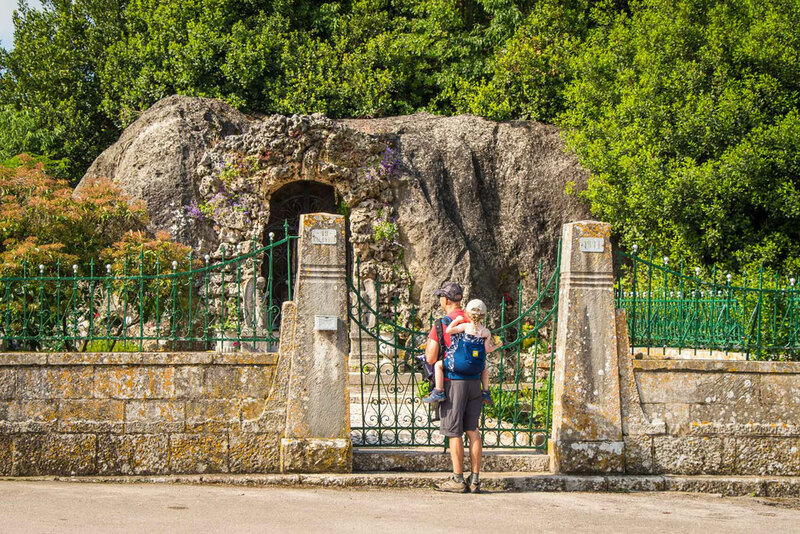 It is here that you get your first taste of the interesting rock formations as you see them scattered in the surrounding countryside. The scenery along here is amazing, with vineyards, old ruins, rock walls, church towers in the distance, etc. After about a half-mile (800m), watch for a small green Kocje sign in the grass, pointing to a trail which veers off to the right. There is a tall hill with many interesting rock formations on it to your right. 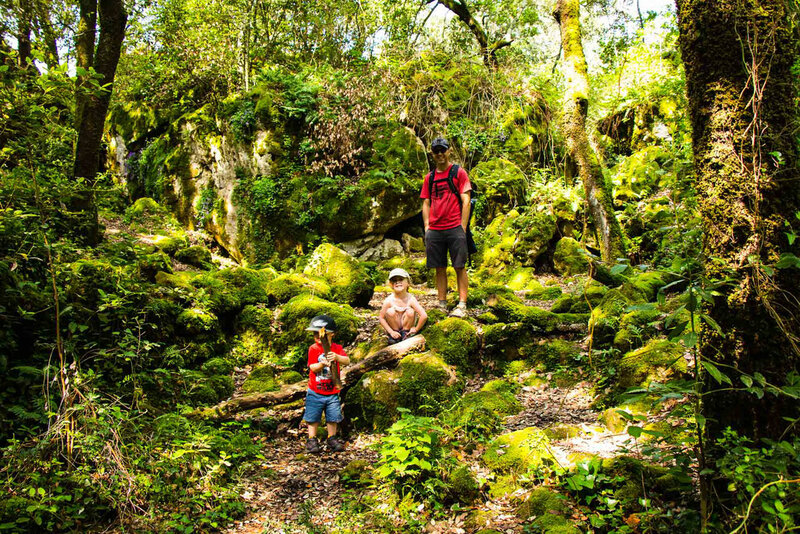 This new trail takes you around to the west side of it, ending at the Kocje protected area. This last section of the hike is pretty challenging though and it will slow you down. It becomes a single person trail through tightly packed shrubs, trees and bushes. 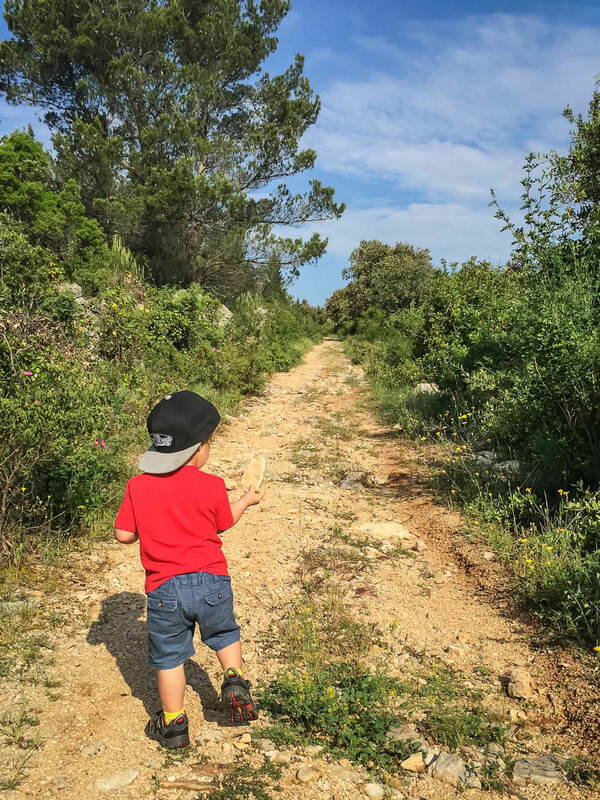 It was especially tough for us with little ones – our two year old didn’t like bushwhacking and wanted to be carried, which made getting through even harder. Thankfully, our four year old ran through the stuff as if it wasn’t even there. Your reward for getting through this tight trail is the Kocje area. 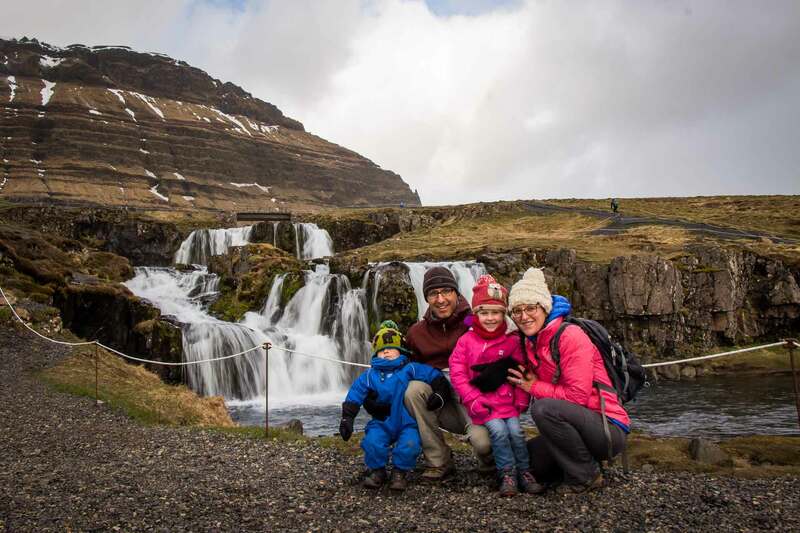 It is a very special place and our kids absolutely loved running around and exploring. 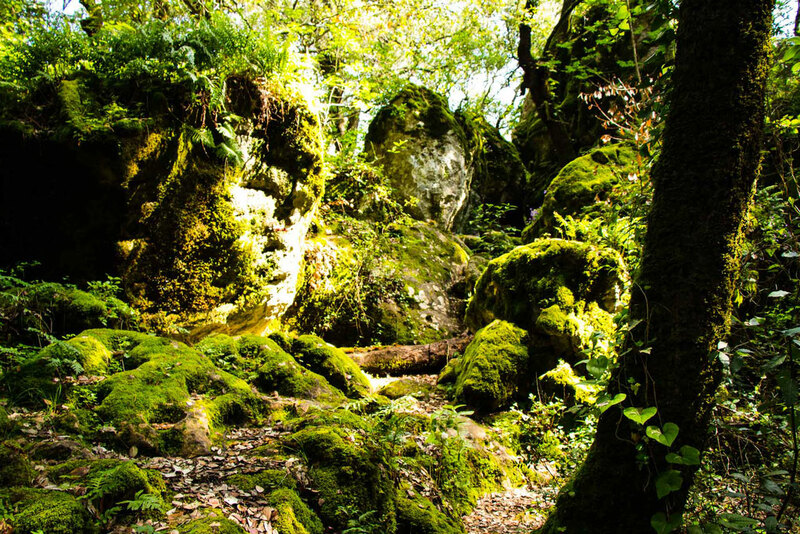 You enter a small valley with large, interesting rocks on both sides. The trail descends into the valley below and it just becomes this magical emerald forest. You really need to see it – words and pictures can’t really do it justice. Moss and ivy cover every inch of this place and it just glows green, even in the shade. 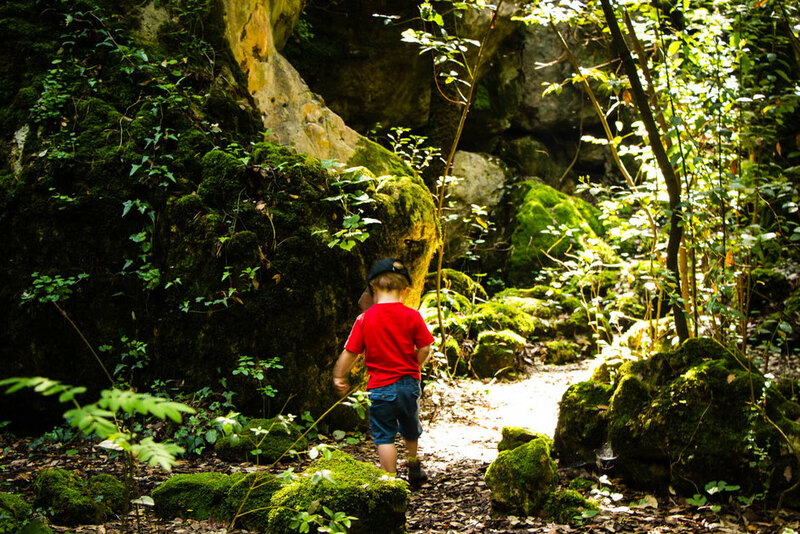 It’s a bit slippery in spots, with some large rock steps to maneuver, so watch your little ones closely. We didn’t find it easy to find our way out of the valley, but the path continues to the north, so keep looking, it’s there. You come out of Kocje and end up on a trail which runs east-west. To head back to Zrnovo a different way, go west. 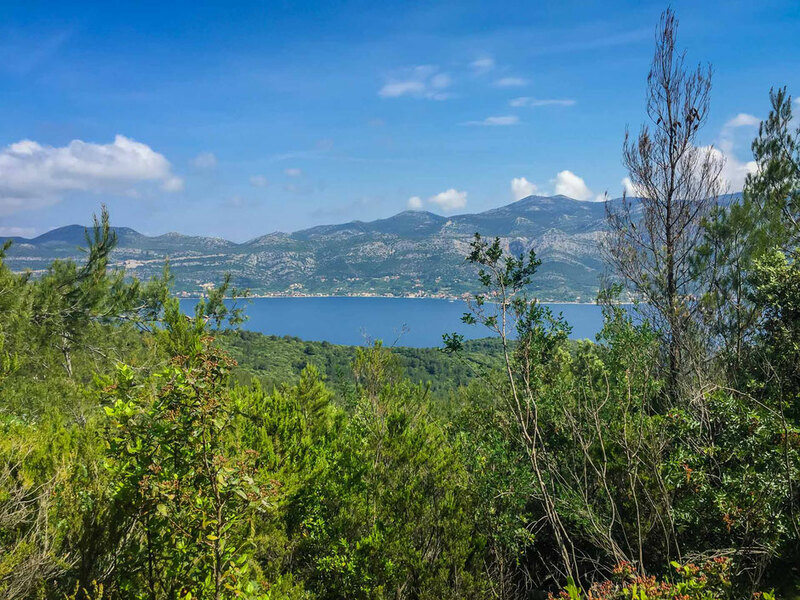 This section of trail is along a country road which gives you some amazing views of the Adriatic Sea and the Peninsula Peljesac below. 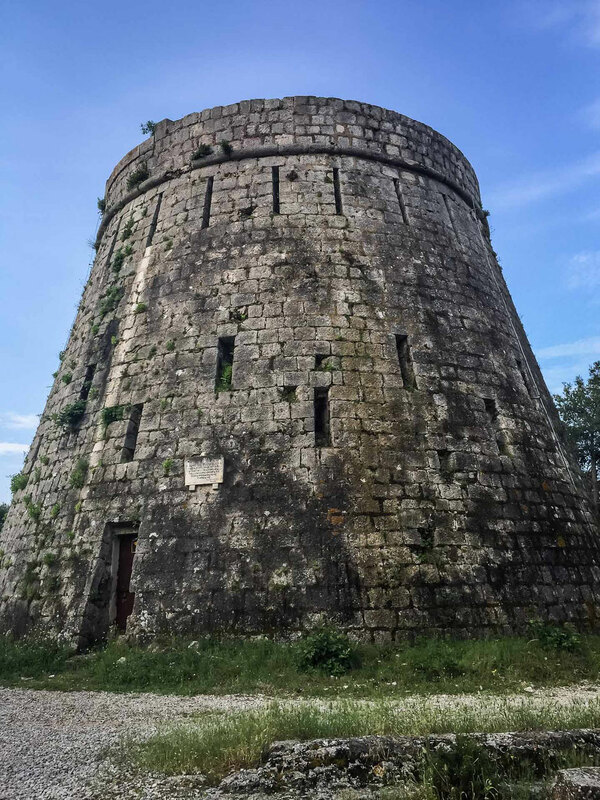 When we got back to Zrnovo, we took the time to walk up the main street again and then we headed back to Korcula via a different route. We left Zrnovo on the same path we came in on, but almost immediately, we turned left. This path takes you north, going steeply downhill. The bottom sections of this trail are overgrown bush as well, which isn’t overly enjoyable, but it’s a short stretch. The trail comes out at a paved road. Turn west until the road comes to a T-intersection, where you turn right (east) on Zrnovska Banja. 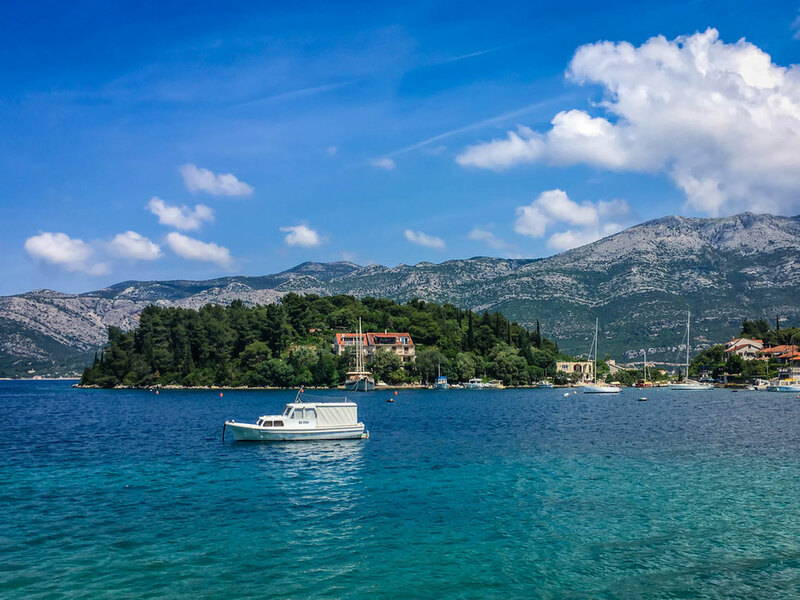 Unfortunately, this is a paved road the whole way back to Korcula and it can be a little busy at times, but the payoff is that it hugs the Adriatic Sea nearly the whole way back. 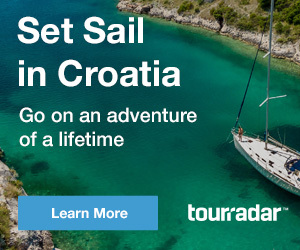 You follow the road around several bends and into many little coves, with charming little boats and incredibly blue water. Our feet were getting a little sore by this point and walking on pavement didn’t help, but we sucked it up and enjoyed the incredible coastal scenery which makes this part of Croatia special. 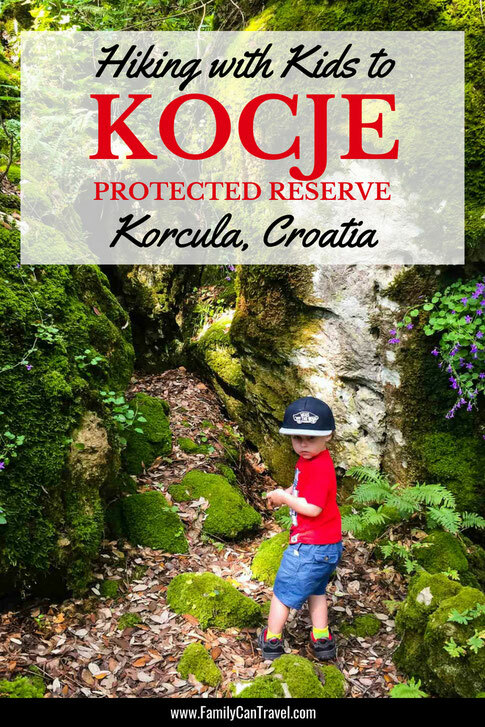 The Kocje protected area doesn’t show up on a Google Maps search. 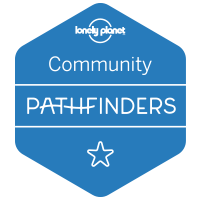 We were able to find it and plan our walking path using the Terra Map – GPS Hiking Maps app. We use Terra Maps extensively when we travel as it enables us to find all kinds of amazing hiking & biking paths wherever we go. All together, this hike took us 4.5 hours and covered just over 7.5 miles (12km). It starts at sea level and reaches as high as 745 ft (227m) above. Wear good shoes as the trail can get rocky, uneven or wet at times. We carried our kids on all of the sections on roads, but they were able to walk almost half of the way themselves. This was a great hike for them and it kept them interested the whole way, which in turn kept us happy the whole way! A great hike! !